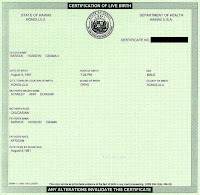 ObamaNation Shrugs: Obama's Birth Certificate: What's to HYDE? I'ma little late, and behind on this News, but there are so many ObamaGates to research that I just can't keep up. There is mucho communication on the net right now, with great info, regarding Barack's Birth Certificate (or the CLB) taken from Obama's own UnSmear ME website and it's probable forgery details being pointed out. One surely has to ask what is on the real deal? And why does Obama feel he has to hide behind, what looks to be, a deliberate forgery? Besides the registrars signature, and the embossed State Stamp, that are missing on this paper, I really only have one question for Barry. There is no such Race, Barry. Obama is not the person he has portrayed; a candidate without depth or experience;associations with questionable persons; gaffes numerous and embarrassing; platform leaves a lot to be desired; and credibility an issue with recent "Flip-Flops;"
that can Win in November 2008 - Hillary Clinton"
(Lafayette Hill, Pennsylvania – 06/27/08) - Philip J. Berg, Esquire, [Berg is a former Deputy Attorney General of Pennsylvania; former candidate for Governor and U.S. Senate in Democratic Primaries; former Chair of the Democratic Party in Montgomery County; former member of Democratic State Committee; an attorney with progressive view points with offices in Montgomery County, PA and an active practice in Philadelphia, PA] released a Petition calling for "A Plea to Democratic SuperDelegates and Delegates to Nominate the Candidate that can Win in November 2008 - Hillary Clinton" on Petition On Line. The essence of the Petition is that Obama is not the person he has portrayed to the electorate; a candidate without depth or experience; one with associations with questionable persons; one whose gaffes are numerous and embarrassing; one whose platform leaves a lot to be desired; and credibility is an issue with his recent "Flip-Flops;" and his wife has raised issues that are a real concern. The Democrats can only win in November 2008 with Hillary Clinton, a dynamic leader who has been totally vetted; who won the majority of popular vote and won the big states.